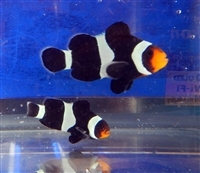 ORA- had been Breeding clownfish for many years and their health and sustainability is unmatched. All ORA fish are captive bred in their facilities in south eastern Florida. Fish pictured are an example only, shipped fish will be similar in color, and patterns. Size 1 1/2" - 3".